State fire investigators have determined that four wildfires in Nevada and Butte counties last October were sparked by Pacific Gas & Electric power lines coming into contact with trees, and that in three of the cases, the utility may have violated state law. The fires are among more than 170 that broke out last October around Northern California, burning more than 245,000 acres and hundreds of homes. The most devastating fires occurred in Napa, Sonoma and Mendocino counties; the cause of those deadly blazes remain under investigation. A probe into the first night of those fires by KQED News found that PG&E equipment appears to have sparked many smaller fires that broke out at the same time in those counties. Cal Fire, the state's firefighting agency, said in a written statement Friday that the findings in the four fires in Butte and Nevada counties came after "extensive and thorough investigations," and that three of the blazes are being referred to county prosecutors for review. Under state law, utilities are required to keep vegetation a certain distance away from power lines. The McCourtney Fire, which destroyed 13 structures and burned 76 acres in Nevada County. Cal Fire determined that the fire that started the evening of Oct. 8 was cause by a tree falling into PG&E power lines and found evidence that the utility did not remove a tree from near the power line. The Lobo Fire, which destroyed 47 structures and burned 821 acres in Nevada County. Cal Fire determined that the fire that started the evening of Oct. 8 was caused by a tree coming into contact with PG&E power lines and found evidence that there was not enough clearance between trees and the PG&E lines. The Honey Fire, which destroyed 76 acres in Butte County. Cal Fire determined that the Oct. 9 fire was caused when an oak tree branch touched PG&E power lines, and found evidence that there was not enough clearance between trees and the PG&E lines. The largest of the four fires -- the La Porte Fire in Butte County -- was also caused by tree branches falling into PG&E power lines, but Cal Fire investigators did not find any violations of state law. Cal Fire spokesman Scott McLean said that these fires all broke out the same night as the devastating blazes in Napa, Sonoma and Mendocino counties and were all fueled by the same dry conditions and extreme windstorms. PG&E declined an interview request but responded with a written statement that referenced a "new normal" driven by "years of drought, extreme heat and 129 million dead trees." "Based on the information we have so far, we believe our overall programs met our state's high standards," the statement says. PG&E increased vegetation maintenance and monitoring of it's over 2 million utility poles in the years of drought since 2014, according to the statement. 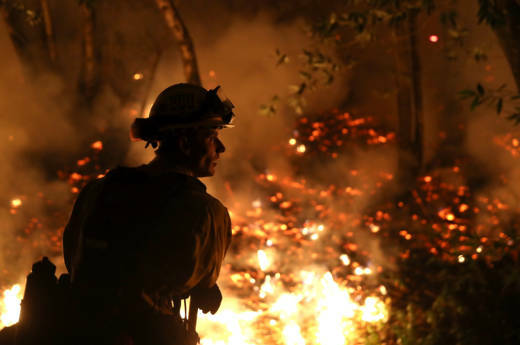 The utility giant also referenced its ongoing legal and legislative fight to remove some of its liability for property damage stemming from wildfires started by its transmission lines. Current law "means PG&E could be liable for property damages and attorneys' fees even if we followed established inspection and safety rules," the statement says. State Senator Jerry Hill of San Mateo, a frequent critic of utilities, pushed back against PG&E's reference to a "new normal." "What the investigation found is clearly the old normal," he said. "In three cases, there was vegetation that investigators deemed too close to PG&E power lines: trees that should have been maintained but were not." The Nevada County District Attorney's Office confirmed it received two investigations from Cal Fire. Butte County District Attorney Michael Ramsey said his office is reviewing Cal Fire's report on the Honey Fire and will later determine whether to file charges. The state monitored PG&E's vegetation maintenance around power lines for several years as a result of the previous case, Ramsey said. "We put into place some additional safeguards at that time that maybe have been forgotten at this point,” he said. "Of course, we can't put corporations in jail. What we do is fine them. We're not as interested in that as much as putting in place those safeguards that we had once before." Raquel Dillon of KQED News contributed to this report.